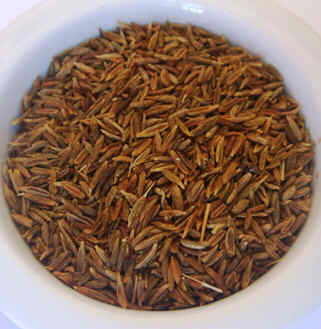 Cumin (Cuminum cyminum) is the fruit of a plant native to Turkestan. Botanically, the plant is from the family of Umbelliferae, a relative of fennel, coriander and anise. Cumin, as a condiment or as a medicine, is used since the time of the ancient Egyptians, as evidenced in the archaeological remains where cumin seeds have found in tombs of Pharaohs. This species has a characteristic taste, slightly spicy and very penetrating aroma. In recent centuries, cumin has been replaced by the fruits of caraway (Carum carvi), with a stronger and more pungent flavor. Cumin is a spice, rich in carbohydrates, protein and fiber, although the small doses used for food do not offer a remarkable contribution of these nutrients. The nutritional importance lies in its contribution in minerals, especially iron, potassium and calcium. We must also highlight its tannin and aromatic terpenes contents with antioxidant properties. For all these properties, cumin is an ideal food to enter in our diet. Designed to flavor dishes: cumin is a carminative remedy par excellence and has numerous components that promote digestion and help the body eliminate gases. Suitable for people with difficult digestion and flatulence. Cumin oils have calming and antispasmodic, so it also can help relieve cramps. For anemia: Because of its richness in iron, cumin is a good supplement for people with anemia. In addition, the aromatic substances in the seeds are suitable to treat loss of appetite that accompanies the symptoms of anemia. Anticancer: treatment with cumin (supplements for at least 6 weeks) helps prevent colon cancer. The amount of iron recommended a day for females is 15mg., And 10mg for men. One teaspoon of cumin bring 3.31 mg. iron, more than 20% of the daily requirement for iron! Dry cumin is more aromatic than fresh cumin, so it should be used sparingly. The taste is very aromatic, although it is easily lost when stored ground. It is preferable to keep the whole grain and crush or grind the seeds just before adding to dishes. You can lightly toast the seeds before using them to get a stronger flavor. Cumin combines well with legumes such as peas, beans or lentils, brown rice, dried apricots or nuts. An idea can be to add cumin seeds to the pan when toasting nuts (almonds, hazelnuts, etc..), So as to provide the aroma. Well suited for osteoporosis. We also propose prepare the iconic hummus recipe with cumin seeds. The taste is delicious and amazing! Store it in a tightly sealed glass jar in a cool, dry place, away from light. Cumin powder retains its flavor for 6 months, while whole seeds preserve their aroma for longer than 1 year. The first written record of consumption of cumin is mentioned in the Bible. The Hebrew people used these seeds to flavor breads and soups. Also in the ritual of circumcision. They used cumin powder or plaster to avoid infection. The Greeks used cumin as medicine and cosmetic purposes to whiten the face. The Romans took cumin seeds after their lavish banquets for its digestive and carminative properties. Formerly, cumin was a symbol of greed. For this reason, the emperor Marcus Aurelius was dubbed with the name Cuminus. During the Middle Ages, it was believed that cumin protected by spells and demons. In Germany the tradition was guests to carry cumin at weddings to enter the ceremony. Cumin is one of the herbs that appears in the Capitulari of Villis, among cultivated spices ordered by Charlemagne. Currently, Kümmel is elaborated in Latvia, a colorless sweet liqueur flavored with cumin seeds. There is a typical Scandinavian liquor made ​​from rye and flavored with cumin, citrus peel, fennel and anise. Popularly known as Akvavit. In Germany a rye bread is prepared with cumin. Also used in sauerkraut cabbage (sauerkraut). In the Netherlands, Gouda cheese with cumin is a delicatessen. France used these seeds to prepare the traditional gingerbread, called Pain d’épice. In Morocco, cumin is added to dishes with lamb and soups. In Mexico, the traditional cuisine “Chili con carne” is flavoured with cumin seeds. Cumin is also an ingredient of Garam Masala or Indian curry.